What Is A SSA-561-U2 Form? A SSA 561 U2 form or a Request for Reconsideration has to be prepared for the Social Security Administration. The purpose is to apply for welfare benefits for the second time if previously you were denied. 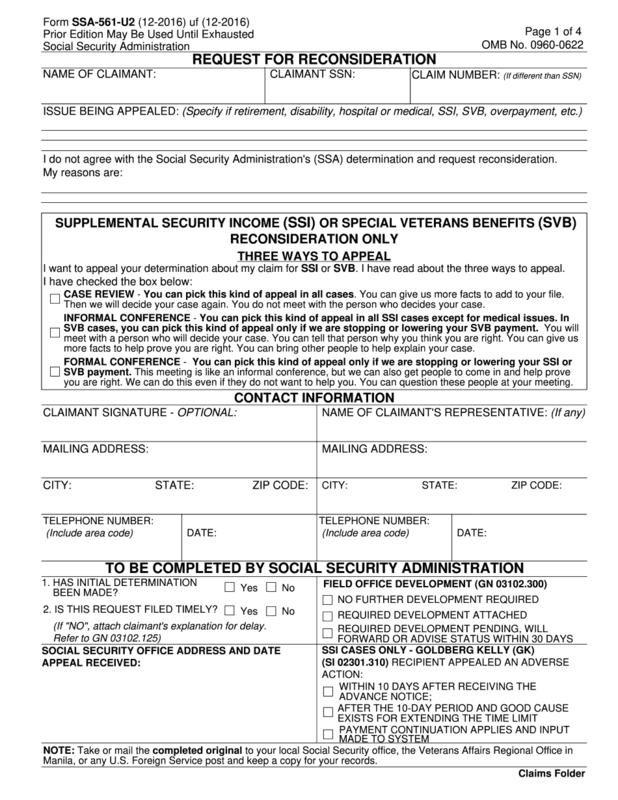 A person who is considered to be eligible for specific support because of disability or other medical reasons should submit this document in order to confirm their rights. To create the paper an individual may find the blank form of SSA 561 U2 online and fill it out. It can be signed electronically and sent to a recipient by email, fax or sms. Read below what kind of information is necessary to mention. Name of wage earner. Leave this space empty if you are claiming for yourself. List points of the SSA’s decision you don’t agree with. Confirm your statements. It wouldn’t be superfluous to consult a lawyer concerned this part. Sign the SSA-561-U2 form and forward it to the counterparty. The rest details will be provided by Social Security Administration person in charge. Before signing and sending, check if provided data is full and truthful. If found any mistakes, correct them. Unreliable information may again lead to denial of your application. Make several photocopies to keep just in case and bring personally if required so.